ISIS has shifted strategies. It’s time for the international community to do the same. Maria Stephan describes ways nonviolent action can weaken the strength and authority of ISIS–and how the international community can help. Head of the United Nations counter-terrorism office told the UN Security Council that “despite military successes against the Islamic State of Iraq and the Levant (ISIL/Da’esh), the terrorist group and its affiliates continue to pose a significant threat around the world”, urging strengthened international cooperation to address violent extremism and bring those behind it to justice. Attack the perceived authority and legitimacy claimed by ISIS. Use humor and satire to undermine authority from a distance. Disrupt the many civil and material services ISIS relies on to operate. Work with international partners to support community resiliency and non-cooperation. 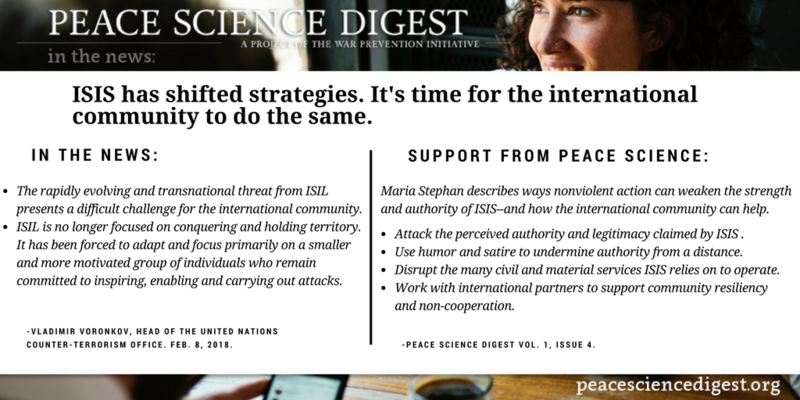 Peace Science Digest: Volume 1, Issue 4. “Defeating ISIS with Nonviolent Resistance”. International community must stay ‘one step ahead’ of ISIL, stresses UN official. United Nations News Centre. Feb. 8, 2018. Previous article Effective local governance allows greater communication and avenues toward peace.